This is the story of an extraordinary business leader, Anil Naik, and the company, Larsen & Toubro (L&T), he has served for 53 years and led for the last 18. Long coveted by the Ambanis and Birlas, L&T has an annual turnover of Rs 1,20,000 crore and a market capitalisation of more than Rs 1,60,000 crore. It is involved in several critical national projects: India's first nuclear-powered submarine; strategic weapon and missile systems; space exploration including maiden missions to the moon and Mars; global infrastructure; airports; metro rail systems; and nearly all of India's nuclear power plants. L&T's Hazira manufacturing complex, Vadodara's Knowledge City and the Kattupalli shipyard have become symbols of world-class Indian engineering and technology. Author Minhaz Merchant spoke to Naik over several months to construct a compelling narrative of a remarkable company and its chairman. What emerges is a portrait of a man whose work and life have been bedrocked on a deeply felt sense of nationalism, synonymous with helping to build a strong and self-reliant India. From a south Gujarat village to the chairmanship of L&T, Anil Naik's journey has been one of grit, determination, entrepreneurial leadership, 16-hour workdays and a unique management style. What emerges is a visionary leader who ringfenced L&T from corporate takeovers by creating an innovative employee welfare foundation and transformed L&T into a global technology and engineering powerhouse. 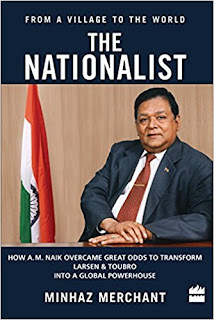 Naik also emerges as a devoted family man and a generous philanthropist who has donated most of his personal income to charities through family trusts focused on healthcare, education and community service. Naik's father, Manibhai, a teacher who spent his life serving the rural poor, was his role model who taught him to be fearless and honest with the motto: 'If you are in the right, you have nothing to fear.' This is the story of a man who surmounted great odds to reach the pinnacle of success, says Merchant. It demonstrates more than anything else that honesty - the quality Naik prizes most - pays the greatest dividend of all in the end: the respect of your peers, the loyalty of your colleagues, and the affection of your family. Minhaz Merchant is the biographer of former Prime Minister Rajiv Gandhi and the late industrialist Aditya Birla. He founded the pioneering media firm Sterling Newspapers Pvt. Ltd, which was later acquired by the Indian Express group. A widely published newspaper columnist, Minhaz's book, The New Clash of Civilizations: How the Contest between America, China, India and Islam Will Shape Our Century, was published in 2014. Recipient of the Lady Jeejeebhoy scholarship for physics, Minhaz lives in Mumbai with his wife Kahini. The couple have two children, Suhail and Tehzeeb.